If you are struggling to keep up with payments on outstanding debt, you are not alone. Like you, many people have fallen into the debt trap. Don't despair, there are ways to get out of debt. Once your goal to be debt free is achieved, stay out of debt and start spending your money wisely. Sekoloto-Gasebole is an old Sesotho saying that means debt never gets rotten. This saying is still true in today's economy. If we do not pay off our debt as soon as possible, it becomes bigger because of the interest we have to pay on the loan. In South Africa, a debt only gets "rotten" as the saying goes, after a period of 30 years. During that period the credit giver can demand payment from you while the debt keeps building up interest. If, for example, you fail to pay a debt of a R1 000 over a long period, you could end up paying a few hundred rands, even thousands more over time. 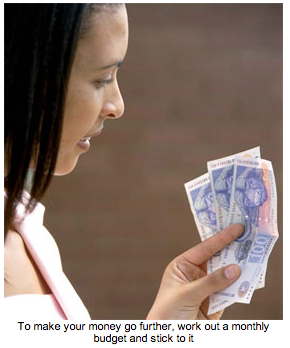 Most South Africans are affected by the rising cost of living. Interest rates have gone up nine times by a total of 4,5 per cent in the past 18 months. Petrol and food prices also keep rising. Many people, especially those who are already struggling to survive, are finding it almost impossible to keep up with paying outstanding debt. But there are ways to get out of debt and the best time is to start is right now. Don't buy anything on credit while you are still paying off other debt. First pay off the outstanding debt. If you have a credit card, don't use it to pay your debt. You will only get deeper into debt with the high credit card charges. Instead of skipping payments or not paying at all, contact the companies where you owe money (credit givers). Be honest with them and explain your position. Ask to make an arrangement to settle the debt. They may allow you to pay smaller amounts per month over a longer period of time. You will pay more interest, but you will be able to pay something and avoid being negatively listed at the credit bureau. If you see no way out of your debt or if you are already listed with credit bureaus, you can go to a debt counsellor for help. The counsellor will do a credit review and help you to work out a payment plan. The counsellor will also contact your credit givers and tell them you have applied for a credit review. During this time you won't be allowed to buy anything on credit. Once your debt is paid off, the counsellor will issue a clearance certificate. This will help you get a positive credit profile again. It means you will be able to buy on credit again in future if it becomes necessary. So, all is not lost. As much as the Sesotho saying says Sekoloto-Gasibole, there is a Zulu saying Okungapheli kuyahlola. This means whatever difficult situation we face, it is bound to come to an end. As soon as you have paid off your debt, try to put some money away to save every month - even if it's just a small amount to begin with. This will help you to get into the good habit of saving. Having savings gives you the confidence of knowing you can deal with unexpected expenses or emergencies without having to go into debt again. Paying for a big item in cash means you will pay much less than if you bought it on hire purchase. You will pay possibly as much as half the price you would have paid in the end. You can even ask for a cash discount. In addition, you will have the power to shop around for the best prices. You may not be able to save all the money you need for bigger items like a car. But if you have some savings, you can use it as a deposit. This means it will cost much less in the end and the debt you need to repay will be much more manageable. Money experts say we should aim to save about 10 per cent to 15 per cent of our net income per month. The earlier you start, the more you will have when you really need it.